Uncategorized | I think therefore I write! You said – I am the biggest tycoon, I own this much properties, I am successful blogger, I have all the trendiest gadgets, my family do proud on me and I have a great girlfriend. Friend- Well, I am not as successful but I have time! When loved ones want to talk to me I have time. Adapted from an old Hindi film dialogue where two friends (brothers) meet at such a point where one talks about own wealth and other just say I have nothing but have mother. Time is priceless. You can not acquire it, steal it or stop it. There is no past and future for it; it comes and lives only in present. For any starting. For anything. Time is now. Don’t you like to peep out from your car, just to have a look at the new colorful funky big size poster put overnight on the same road that you travel everyday? Take the case of streets where you typically walk through – you would steal a look to see what the funny punch line of the advertisement is even though you are involved in a chatting session. This is Street art or some call it graffiti or can be called as ephemeral art. These are made by those painters whose names you can’t recall but would appreciate their effort. The purpose of doing such work is not always monetary gain or to spread words about a product but generally intended to evoke popularity on certain current issues or trends. Like my friend from Germany told me- if you walk inside the lanes of old cities you will see lots of graffiti work on hip hop culture. And one of my Indian friend who is recently coming from USA told one can see lots of art work like football players, pop singers etc in towns but not in posh city like Seattle. Well, street artists are wanderers who, if are financial sound or get an opportunity, love to spread their street art work in other countries’ streets too. You could check here a good collection of street artists from around the globe. The medium they use to paint an art work is spray-paints. That somehow reminds me of my college where we used to buy silver & black color spray from stationery and painted the columns and floors in anticipation (of nothing). Some artists use stencil and mosaic work and it can be called as Guerilla art too. From the world capital of street graphics New York to the technically advanced Tokyo to busy Barcelona boulevards, one can see the vibrant graphics depicting own vernacular to tell about the inside city story and traditional culture. These culturally rich graphics talk a lot and there is a lot of meaning behind them if you observe it carefully – either it could be taunt on politicians or fun of a product. It represents the urban culture which includes music, films, politics or an issue. 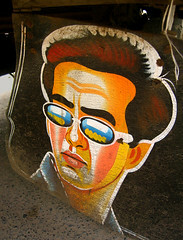 There is no way when I am talking about street art and not write in-depth about India. 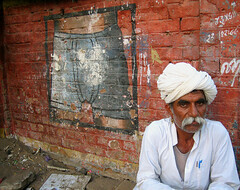 Street art in India have different approaches. It might be famous on special occasion like at home at the time of Onam festival (A different form of making momentary art work called rangoli; flowers and sand colors are used), at college fests or you could see at old cities shop’s advertisement boards. But gone is the era when film posters were hand drawn or artist painted the big size banner on heavy traffic road by keeping awake whole night. Now streets sign in digital printed banners or see only offset and screen printed ads. Still if you go inside the old city areas or the small towns and marooned village one can locate some of old style art work. Bollywood cinema that was once famous for well painted Madhubala portraits and nicely composed posters of hindi cinema of seventies are nowadays put on exhibition. The bid rate for such rare posters are also high as the popularity of treasuring such work among media people is quite in demand. The typography used in posters, the brush strokes and artist signatures made by using oil paints or poster colors had its own charm & charisma to bring the audiences to theatre. Even to promote the Dabur Lal dant manjan (a tooth powder brand) or Rupa hain mere pass – an ad of baniyan (Vests). The striking power of street visuals will not fade as long there are messy artistic people in existence. They are the ones who spread the cultural experiences with bright colors painted on a big spectrum for the common people. Some more posters painted in Monsoon fest time. Copyrights of all Images used for this blog post belong to their respective owners. 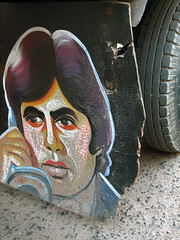 Updates: Check the Big B (Amitabh Bacchan, the legend of Indian cinema) old films posters. Change is inevitable. As Confusius said – They must often change who would be constant in happiness or wisdom. This new template is totally representing the always-changing weathers of India. Monsoon is here. So it’s very much suiting. Through I have to do some changes (coding actually) to make it compatible, as few of links are lost not working, pictures displacement or so. Better give me time or like it as it is. Victory striked after 24 years. Finally Italy won the world cup. French wine didn’t work. I’m not going to write more about soccer. As already lots of people wrote about it. I enjoyed yesterday (9th july) match. Actually I was not watching and talking with a friend who is in Italy. They guys were going to see second half on big screen. And seems so excited that I could saw that in letters of our chat. And yesterday only I received few pictures of Rome from my friend. I always thought of visiting Italy specially Rome once. I was just browsing net and found some information. Italy is a highly developed country with the 8th highest GDP (2006). Italy word derived from a word that means Bull.Now comes the most important thing the Renaissance period. You might have read this word in history or in details if you are into architecture, design field. That influenced the whole European culture and other parts too. 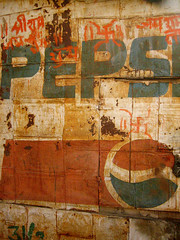 Because of cultural heritage it has been an influential place for designers. Da Vinci, Michelangelo, Raphael are few of them. In terms of science too some great scientists came from here – Galileo, Fibonacci (remember Fibonacci series) etc. And your favorite fashion designers like Dolce & Gabbana, Gianni Versace, Prada and Giorgio Armani are all big names in the fashion and glamour world. After all Italy is well known for setting trends and responsible for the revolution of haute- couture. Not only in fashion but Italy given great designs to automobile companies too. And creativity and level of excellence you can see in Ferrari or Peugeot205 and Fiat Uno designed by Pininfarina. And the story behind Vespa scooter (I have seen the success of it in India) is that after second world war Mass destruction weapons companies- which made warplanes etc were in trouble so to make living by using more practical transport. Italian leather sofas are always a preferred choice when things come to choose furniture for living room. Might be it is in the great heritage of art and architecture of this country, from Renaissance era to Rococo period. Check these classic designs of Italian furniture. What to say about Italian food, you all love pizza & pasta. Through northern Italian cuisine favors butter & mascarpone cheese and southern use more of mozzarella cheese. Ahh I can sense the smell coming from the near by food court. Thanks to Pragati for sharing photographs of Italy.